The Goose used to be such a good eater. Unfortunately, she’s a toddler and the finicky nature of a toddler has finally caught up with us. Gone are the days when she’d happily eat anything on her plate like Pasta with Chickpeas and broccoli. No these days, all she wants is popcorn and cookies. 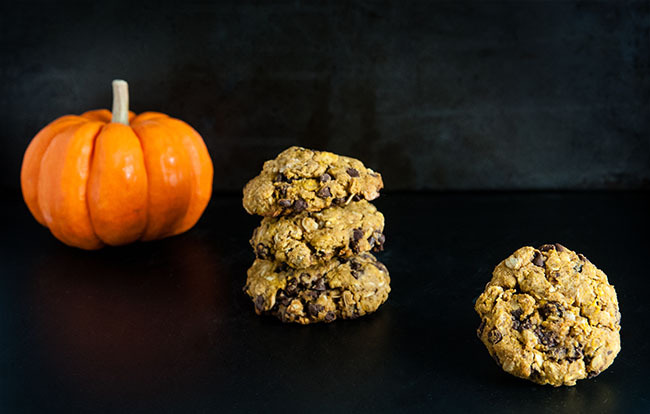 That’s where the idea for these healthy pumpkin cookies came in. We are pretty relaxed in our house with rules. We don’t mind letting her have a cookie occasionally and popcorn is a much better snack than say potato chips. She does still pick at veggies. In fact, just last night, I witnessed her lick a piece of broccoli. But, mom guilt is real you guys. I mean there are only so many cookies I can let her eat before I feel like I am nutritionally depriving my kid. And there’s only so many times I can tell her no to popcorn and cookies before I feel like she’s never going to eat enough. I worry that she’ll be hungry, but I feel guilty giving her food I know she’ll eat just to fill her belly. Moms just can’t win, right? 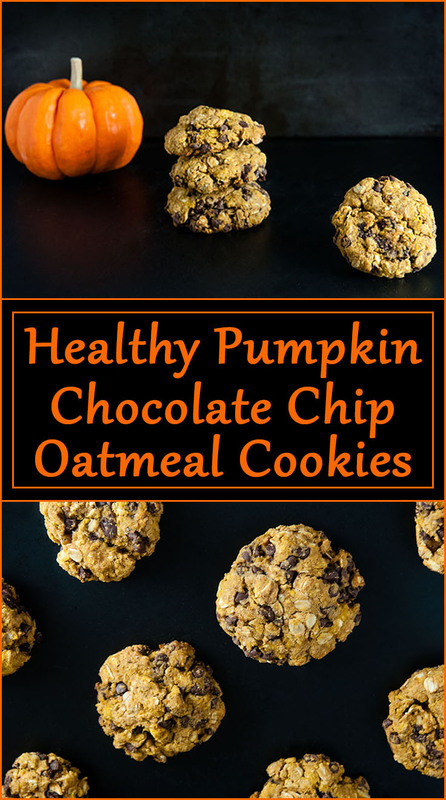 Well, I decided to beat her at her own game and I came up with these healthy pumpkin cookies. 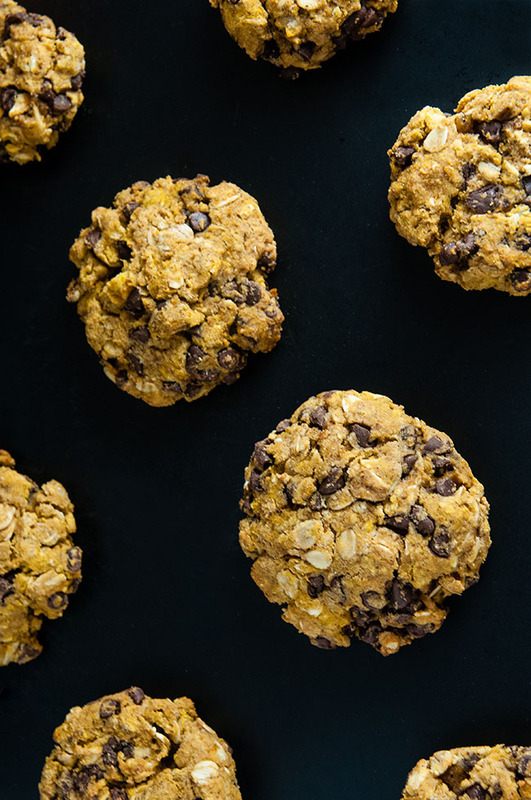 These cookies are gluten free, full of whole grain from oats, and free of sugar except for the chocolate chips. Plus, the pumpkin has some nutritional value- vitamin A and C- so I don’t have to worry about rickets. Right? I don’t know that they qualify as “health food” exactly but I figure it’s better to let her eat these cookies than it is to let her eat chocolate chip cookies. Further making me feel like a better mom, these cookies were really easy to make so Goose and I did them together. Ok, she basically just ate some raw oats and dumped a lot of cinnamon into the batter. I still feel like our first baking project together went well. She did eat these right up. Preheat oven to 350. Spray 2 cookie sheets with nonstick spray. In a large bowl, gently combine the rolled oats, flour, baking powder, baking soda, salt, and cinnamon. Set aside. In a separate bowl, whisk together 1 egg yolk, pumpkin, vanilla, coconut oil, honey, molasses, and pumpkin butter. Gently fold the dry ingredients into the wet ingredients and stir until just combined. Roll golf ball sized pieces of cookie dough and lay them out on the cookie sheet. Gently flatten each one. Bake for 7-11 minutes at 350 or until the edges of the cookies just start to turn golden brown. 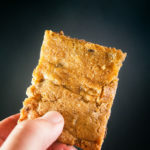 Use gluten free all purpose flour and gluten free baking powder, oats, and vanilla to ensure a gluten free cookie. Feel free to use regular all purpose flour if not following a gluten free diet. yum! I think both my kiddos would love them! Ooh my! Delicious! Totally saving this recipe. Can’t wait to try it! You had me at gluten free! These look absolutely delicious! Thinking about making them this weekend! Oh I hope you loved them! Is it oats or is it gluten? Could you try gluten free oats? If not what about quinoa? I bet you could try cooked quinoa. It’s would still keep it nice and healthy for you. And if it were me, I might throw in some chopped walnuts for texture. If you try it, let me know. I have a feeling I am going to be baking with quinoa very soon. These look so easy and tasty! My boys would love these! 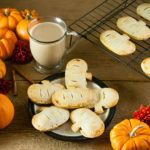 These pumpkin cookies sound delicious! I love adding hearty oats to desserts, and your recipe certainly looks tasty and healthy. Wonderful! I look forward to trying it. Great idea these sound really good. I love everything pumpkin! 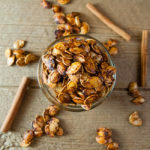 These look SO good, and I’m all about some healthier snacks. Thanks for the great recipe! Healthy snacks are where it’s at! Those cookies look tasty and she’s adorable! What a wonderful recipe! I will be sure to share it with my girlfriends. We are always looking for healthy alternatives for snack time. Thanks for sharing! Hope it’s a hit! 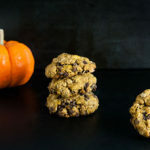 I don’t know that I’ve ever had pumpkin cookies. But these ones look like they’re easy to make and like they’ll be a hit. So easy! I made them while holding my toddler. She dumped in the cinnamon. And I do mean dumped. These cookies look so scrumptious!! 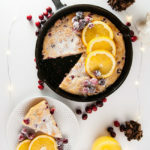 So perfect for autumnal desserts! These look so good! The texture of them kind of reminds me of some no bake cookies or oatmeal cookies. Love it! Yes, the oatmeal does give it that kind of chewy texture. OMG. Yes. Healthy cookies are so hard to find. And really don’t we all just want cookies all day long? I have to give these a try. I am a huge anything pumpkin girl!! Pumpkin is life in October. I love cookies made of oats. This is fantastic for Fall!